Ah….Mondays and Laundry. They kind of conjure up the same feelings, don’t they? Today, I’m going to give you a reason to be thankful for your tiny laundry room: Little spaces are easy and affordable to decorate! Treat yourself to a few well-chosen organization tools and fun finds to brighten up your wash day attitude. I have a soft shade of blue on the walls in my washroom that I absolutely love. Add a favorite shade to make yours a little more inviting! Just have a laundry closet? How fun would it be to swing open the doors to this yellow and white dotted paper from Anthropologie? I love the bold zig-zag pattern on this charcoal and white chevron rug, just $21 at Crate and Barrel. If you weren’t blessed with ample cabinet space (and who was? ), take a cue from Pinterest: The “shelf across the back of the washer and dryer” craze is one trend that ought to be followed! I show a reclaimed wood shelf from Restoration Hardware, but you could just as easily make your own with an inexpensive pine board and bracket set. Have Lowes cut the board for you! Put up a message board…you’ll thank me! Even if there’s no room for a drying rack, you can hang a few small hooks on the wall, or even attach magnetic hooks on the washer itself. Tree-branch hooks from StudioLicious on Etsy, $25. Cute finds like a matching ironing board cover (West Elm) and jars and decanters (Anthropologie) for soap and stain treatments are inexpensive additions with a lot of impact. Face it, we spend a lot of time in this room! Freshen up the space with little things that make you smile. Peppy plant, $12 at Pier1, and adorable artwork from SassyTalk on Etsy, $25. 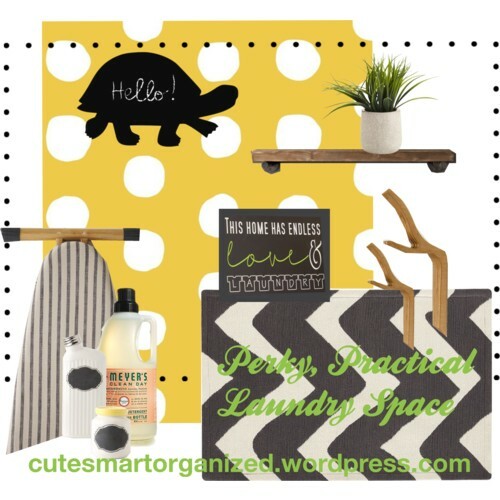 Are any of you sprucing up your laundry room right now? Let us know what you’re up to! « Did Someone Say Weekend?